Sony unveils multi-room speakers and systems with high-res support | What Hi-Fi? 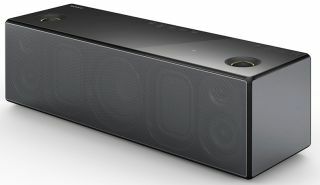 Sony has announced three new wireless speakers and a micro hi-fi system as part of a new multi-room audio lineup. All new products support high-res audio upscaling. Sony has included its S-Master HX Digital Amplifier technology, which aims to reduce distortion and DSEE HX which claims to upscale MP3 files to near high-res quality. The middle speaker of the three: the SRS-X88 (£349) delivers 90W of power through its five-speaker array. This includes two Super Tweeters, two mid-range drivers and one subwoofer. It too features Sony’s S-Master HX amplifier and DSEE-HX upscaling. Finally, the SRS-X77 (£259) portable speaker (pictured) features a built-in rechargeable battery which claims to deliver ten hours of playback time. The X77 features entry-level versions of Sony’s audio technologies; S-Master amplifier and DSEE upscaling. Multi-room audio can be enabled through Sony’s SongPal app. It can be used to control different music sources for different speakers, or alternatively, to group all the speakers together on the same network. The speakers also support Sony’s LDAC codec, which aims to deliver higher quality Bluetooth streaming. All three speakers come with NFC for one-touch pairing to compatible devices, plus support for Google Cast and Spotify Connect. Sony’s new range of wireless speakers will be available from June. Also announced is a new micro hi-fi system: the CMT-SX7B. It too supports multi-room audio, and can be used in conjunction with Sony’s new wireless speakers or the company's recently announced home cinema products. The system accepts music from a variety of sources, including CD, USB, Google Cast and Spotify Connect. It also features a DAB radio tuner and support for playback from iOS or Walkman portable devices. Like the wireless speakers, it features Sony’s DSEE HX upscaling technology and S-Master HX amplifier. The CMT-SX7B micro hi-fi system will be available from July for £449.